On a daily basis, people consume products and services in voracious gulps. Mall shopping, online shopping—you name it, consumption is the very blood that electrifies our social structures. It is due to this that companies that are tasked to deliver these products to the consumers were born. 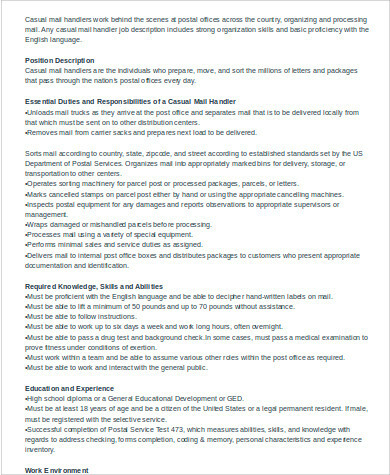 If you are a manager of such company or an owner of a small delivery business, then you need to ensure that you hire a qualified person to pack, handle, and deliver packages toward your customers/clients. Choosing the most qualified one will be easier if you use an appropriate job description as basis for your employee selection. 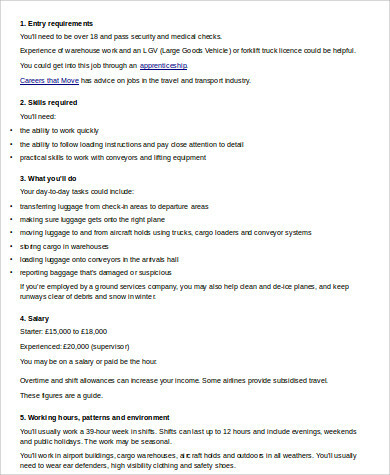 Furthermore, a job description can also help you manage your package handler’s performance. 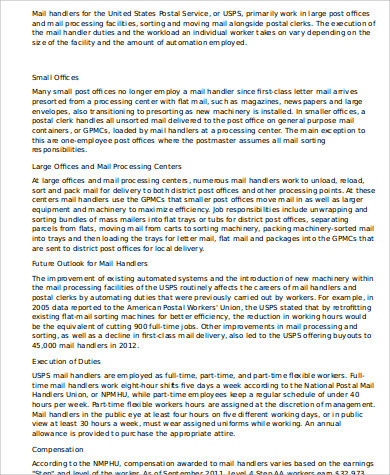 For your guidance, you may scroll down below and download our free package handler Job Description Samples. These are ready for printing, and if you wish, you may edit these according to your courier business needs. 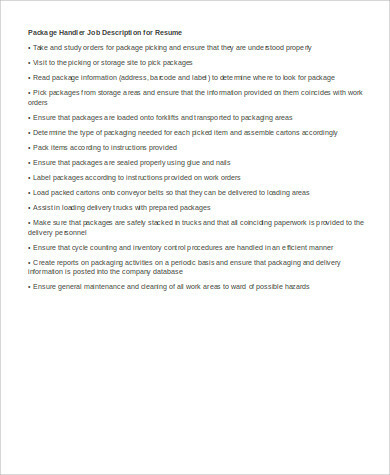 A package handler is a personnel or employee who usually works for courier and delivery companies. He/she is expected to pack products and materials so that the same can be delivered safely to their destination. Sometimes, he/she is also tasked to assist or manage the safe delivery of these items including the documentation and procurement of necessary delivery paperwork. any package handler of courier and delivery businesses. 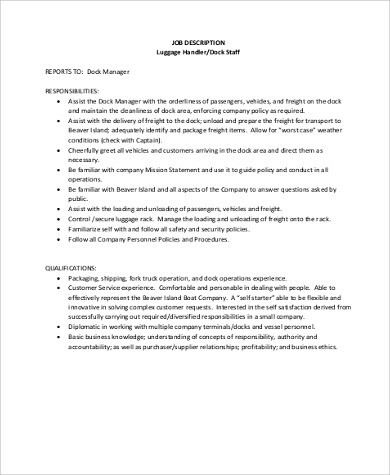 Speaking of packages, we have Stocker Job Description Samples that may also prove to helpful to your courier business’ needs. Simply click on the link provided. 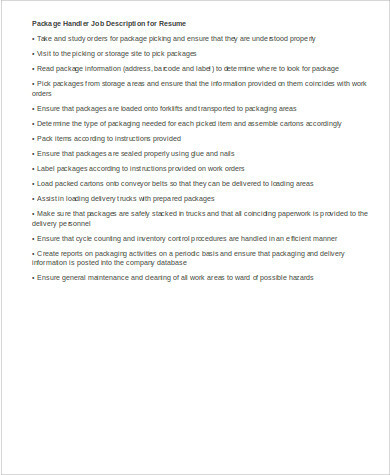 ensure general maintenance of all work areas in order to prevent possible hazards and to ensure the packages’ quality. 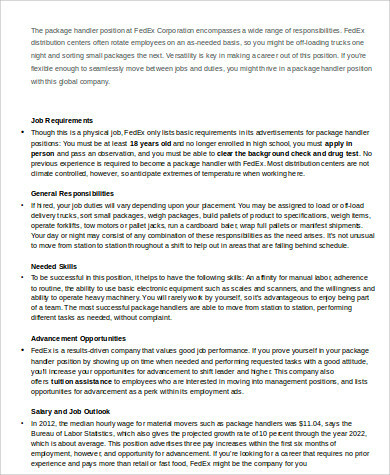 Aside from package handler job descriptions, we also have Sample Buyer Job Descriptions that are also available for download.